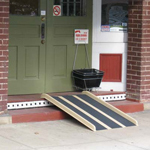 Solid wheelchair ramps are the simplest of the portable wheelchair ramps. 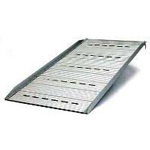 They are a solid flat platform that can moved from place to place as needed. They will not fold and the larger sizes can't easily be loaded into a vehicle. 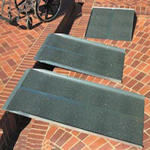 Solid ramps are, depending on the model, can be anywhere from 29" to 36" in width and are available in lengths from 2' to 10'. 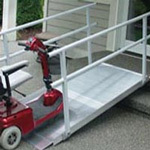 They can be used as a portable ramps that can be moved from place to place or secured in place for permanent use. When secured to a doorway local building codes may apply and the local building department should be consulted. 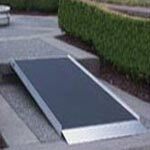 Most solid ramps are made of aluminum but there are a couple of fibre-glass models available on the market. 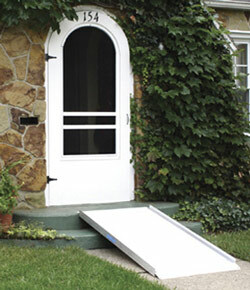 Depending on the manufacturer, the doorway solid wheelchair ramps will have weight capacities of 600 lbs. to 850 lbs. Weight: 7.7 to 29.5 lbs. Usable Width: 30" or 36"
Weight (without hand rails): 45, 60, 75 or 90 lbs. Weight (with hand rails): 70, 85, 105 or 130 lbs. Overall width (without hand rails): 37"
Overall width (with hand rails): 40 1/4"
Weight: 12, 18, 22, 28, 32, 37 or 42 lbs. Weight: 15, 20, or 25 lbs. Usage Guidelines: Low Porches & Decks, Curbs, Steps, Thresholds etc.